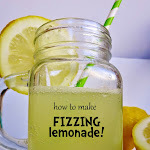 Once again I have been trying to come up with activities that are easy and open ended enough that both my 18 month old toddler and 4 year old preschooler can do together. 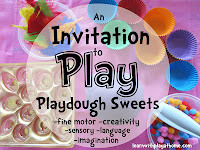 Playdough is one of our most used materials and today's Invitation to Play and Learn provides a number of different experiences and practice of skills for various age groups. Toddlers will be working on using their senses, fine motor skills, manipulation and cognitive skills whilst in addition to that, Preschoolers are working on letter recognition, imprinting, patterning, creativity, spelling, letter sounds and more. There were no instructions necessary. I provided as shown above and they both leapt straight in! Little N grabbed at everything in sight to add to his playdough whilst Maddie's approach was much more deliberate and planned. She set about preparing her dough. I am starting to take more note of the specific differences between the toddler and preschooler behaviour in the way they approach and engage with activities. Whilst I've read all about all the developmental levels etc and have seen Maddie's transition from toddler to preschooler, it's even more pronounced when you have one of each to compare ;) Super interesting! 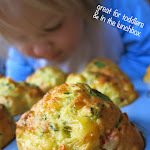 After watching his big sister rolling out the dough, Little N tried to mimic the actions. A clear demonstration of the importance of Peer Learning. As he grabbed at letters we tried to talk about the names and colours. This is just part of the continual reinforcement of the connections between the verbal cues and what he was experiencing. The playdough alone wasn't enough and he came back from the play kitchen with a pan to add his ingredients too. He was participating in his own role play. Meanwhile, Maddie had been quietly working away with the playdough and individual letters. She stamped a bit but as we've done a lot of playdough texture and pattern imprinting in the past, she seemed keen to work on different things. Her hand-eye coordination and fine motor skills got a good workout as she manipulated the knife, cutting around the outside of the letters. 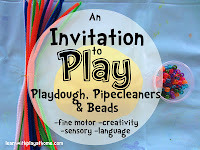 - Simplify this activity by providing some rolled out playdough and a couple of letters for children to stamp with. Demonstrate stamping in the playdough and see if they can pick the letter back out again. Having school age children find the letters for their spelling words and print them in the playdough to spell the word. 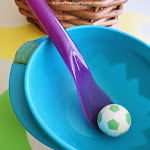 - Mix it up with different coloured playdough and other decorative materials such as beads, buttons, pebbles etc. 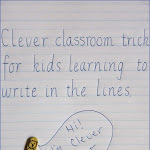 - Use descriptive language that goes with this experience to help develop your child's vocabulary. Eg "roll, flatten, print, imprint, pattern, texture, squishy" etc. - We use playdough a LOT! Click the following pictures to take you to the activities. This looks like so much fun! I love the mixing of the letters with play dough. I have pinned this post.